What constitutes good outdoor living design, and why? What are the elements of good design? Are the decisions you make based on color, size, and shape alone? While all those are crucial to a great design result, they are not necessarily true design decisions. At Archadeck of Kansas City, we believe in the idea that form follows function – that function should be the foremost consideration in all outdoor living design. Good design is individualized. It is specific to each of our outdoor living clients, and a great design for one family is not necessarily good for the next. Each family or individual, and their home and yard will require very specific design elements based on their needs. 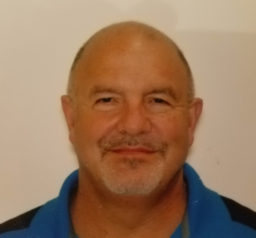 As n experienced deck builder, Archadeck of Kansas City will listen to your outdoor living needs to design a space that fits your size, budgetary, usage, and desired maintenance level requirements. We will help you decide the space you need based on the size of your home, yard, family, and entertainment aspirations. If you have a smaller home and family, and only plan to host a few loved ones from time to time, an over-sized outdoor living space will not best serve you. If you have a large home and yard with plans to host big parties, cookouts, or holidays, we can custom-tailor an expansive outdoor living space to accommodate your needs. At Archadeck of Kansas City, experience has shown us that one design or size does not fit all! Good design is about form and function. Great outdoor living design is elemental! Once the needs mentioned above are outlined, and your outdoor living design begins to take shape, Archadeck of Kansas City can help you make decisions to ensure you love living in your new space and that it fits your needs and wants. Here are some key considerations for your design options. Imagine you have decided that a new screened porch will best suit your needs. We work together to determine the orientation of your porch. If it receives too much sun, it might be too hot to use and enjoy it. You also don’t want a space that’s too dark and shaded. If your porch is poorly situated, and open to direct evening sunlight, you will not be inclined to use your porch during those hours. Archadeck of Kansas City can plan the orientation of your porch based on location and situate it to eliminate over-exposure to intense sunlight. We can position walls or fireplaces in a manner that will deter excessively uncomfortable light entry during any time of day. Keeping you outdoors comfortably during hours of would-be harsh sunlight is good outdoor living design. 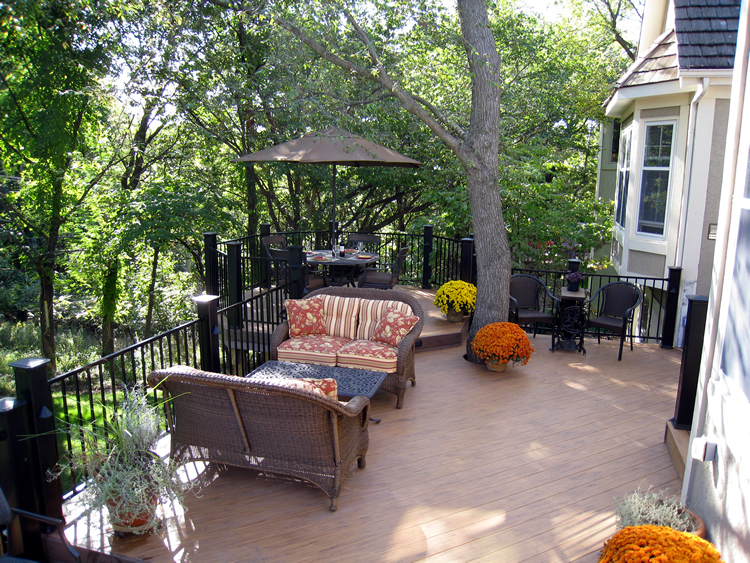 See screened in porch ideas by Archadeck of Kansas City. 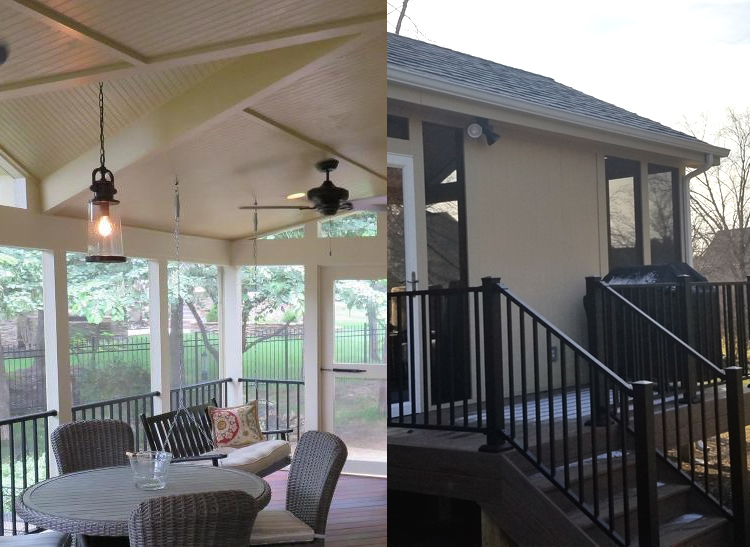 If you are planning to use your new outdoor space as an extension of your indoor space by adding lighting, ceiling fans, and other electrical elements, Archadeck of Kansas City can help you plan these options. We can make recommendations regarding placement of your TV. For instance, we can create a TV wall to specifically keep the grill deck out of sight from your screened porch. By finishing your ceiling, we can obscure electrical wiring, and install lighting and ceiling fans cleanly. Will you be decorating your space for holidays, or parties? By placing outlets in the ceiling, you can easily hang strings of lighting for those uses. If you will be using lamps, we can place outlets based on your intended furniture layout, where lamps will be located. Part of your great outdoor living design plan will be determining the most useful placement of your outdoor fireplace. As mentioned above, we can plan your fireplace’s location based on blocking sunlight, or possibly giving you privacy from close neighbors. Suppose you love the look of a wood deck, but do not have the time or inclination to perform periodic maintenance to keep your wood looking great. In this case, we would recommend selecting a low-maintenance decking material, such as AZEK or TimberTech, which will keep you from having to sand or stain your deck. 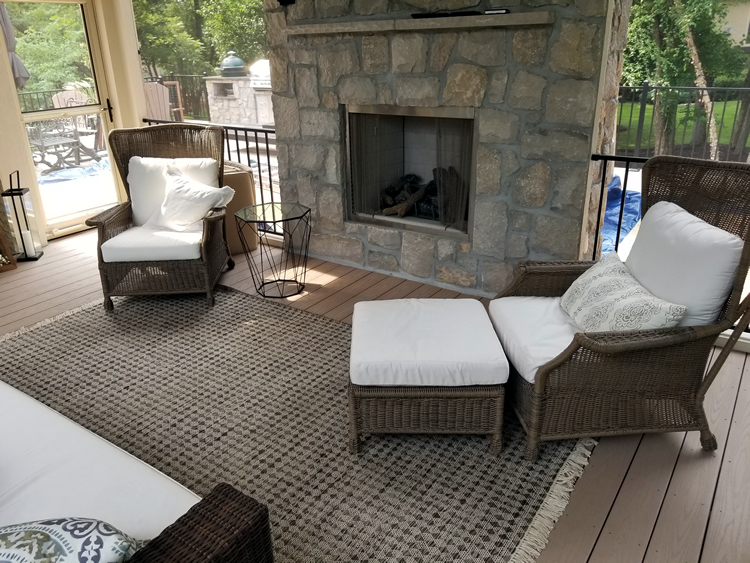 Archadeck of Kansas City can recommend a low-maintenance deck product that will give you the look of a wood deck without the drawbacks of yearly maintenance, that will have you enjoying your outdoor living space, rather than working in it! New products that match your original home? 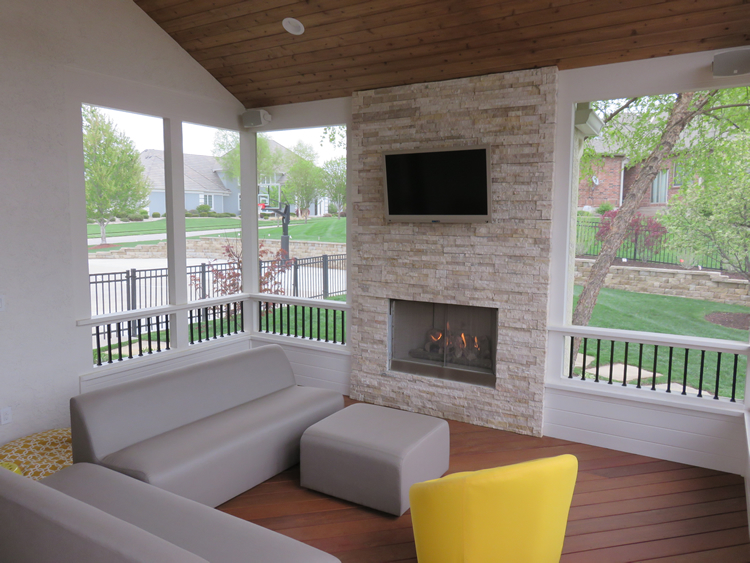 It is of the utmost importance at Archadeck of Kansas City that we design and build an outdoor living space that looks original to your home. We have many years’ experience and will create a space that looks and feels like it’s a natural extension of your home. We can specifically use siding, trim, shingles, masonry, and paint colors that will perfectly match or complement your home and create a cohesive design aesthetic. Additionally, the shape and size of your new outdoor living space should be complementary to your original home, and we can create custom shapes and sizes that fit the style of your home. As your trusted Kansas City area outdoor living experts, Archadeck of Kansas City knows that the depth of good design is much more complex than most clients realize. We can deftly guide you through an outdoor living design to achieve the best outdoor living space for your home, family, and lifestyle. We can work to create the most beautiful and usable space you have imagined living in. 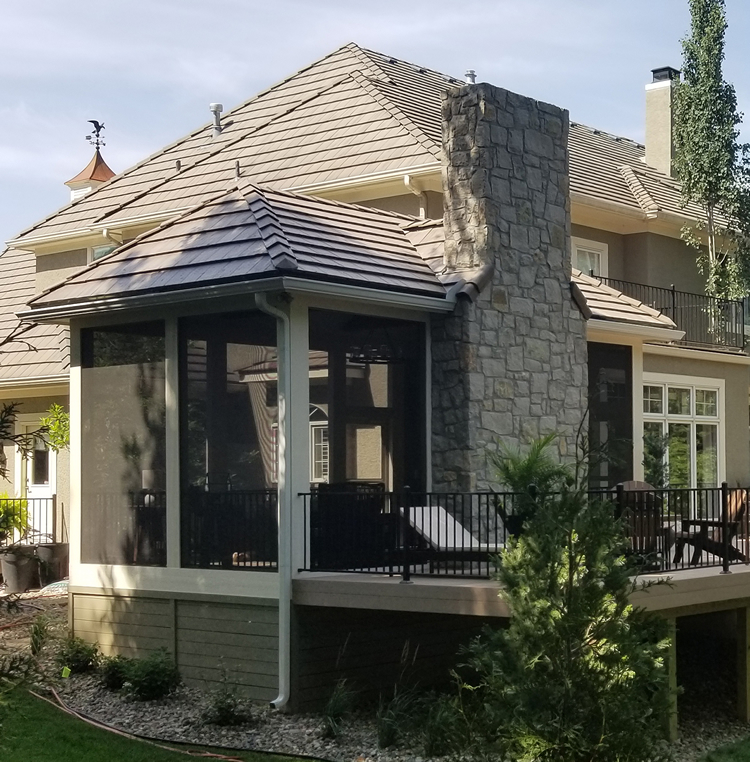 If you are considering adding an outdoor living space to your Kansas City area home, give us a call for a free consultation at (913) 851-3325 or drop us an email. We look forward to working with you to design the perfect new outdoor living space for your home.